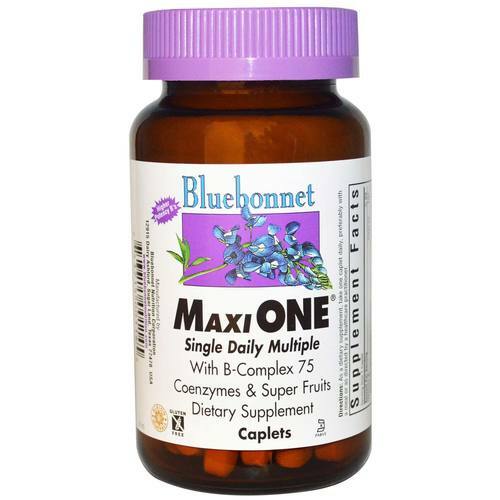 MAXI One with Iron from Bluebonnet Nutrition contains a wide range of ingredients including but not limited to B-Complex 75 and Super Fruits. Advertências: Contains soybeans. Accidental overdose of iron-containing products is a leading cause of fatal poisoning in children under 6. Keep this product out of reach of children. In case of accidental overdose, call a doctor or poison control center immediately. Keep out of reach of children. Do not take more than recommended dosage. Notas: Free of milk, egg, fish, crustacean shellfish, tree nuts, peanuts and wheat. Also free of yeast, gluten, barley, and sugar.